If ShipRush has been installed on your machine the ShipRush preferences will be available in the list. ShipRush is a 3rd party shipping solution published by ZFirm which integrates directly into All Order for shipping UPS, FedEx and USPS. Contact us for more information about integrating ShipRush into All Orders. 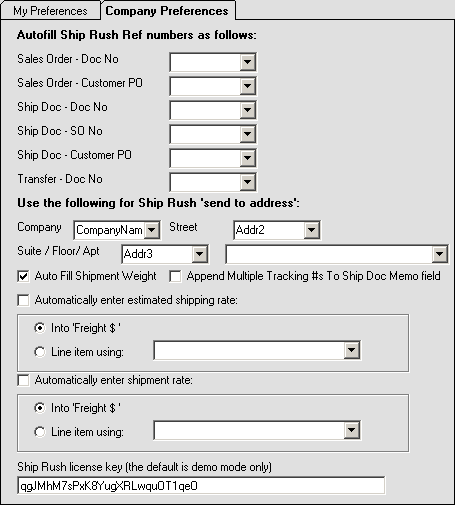 Autofill Ship Rush Ref numbers as follows: When creating shipments in ShipRush there are Ref # fields that can be filled with data. Select any data you want transfer to the Ref # fields with these drop downs. Use the following for Ship Rush 'send to address': Use the drop down to select which parts of the customer's address should be filled into the Ship Rush ship to address. You can also select which email address of the customer's, if any, should be used for sending out shipment notifications. Auto fill shipment weight: Check this to auto fill the weight on the shipment based on weights entered into All Orders for the items on the shipment. If you plan on using a scale to weigh your packages leave this unchecked. Append multiple tracking #s to ship doc memo field: Generally when shipping a package the tracking # will be written back to All Orders in the Ship Doc Reference field. If you are going to ship multiple packages per shipment and want to keep a record of all of the tracking numbers check this preference to have them added to the Memo field of the transaction. Auto enter estimated shipping rate: If you want the estimated ship rate written back to All Orders, you can select here where you want it to go here. Auto enter shipment rate: If you want the shipment rate to be written back to All Orders, you can select where you want it to go here. Ship Rush license: By default this will be filled in with a demo key. This will allow you to test the integration between ShipRush and All Orders. While the demo key is present only demonstration labels will print.